If you are looking for a fun way to keep busy, I have a great idea for you. The coming weekend will be a busy and exciting one in the Adirondack North Country. On Saturday, the best alpine skiers in the United States will be racing at Whiteface competing for the national title. From March 20-23, Whiteface Mountain in Wilmington, New York, will once again host the VISA U.S. Alpine Championships. Naturally, a number of Olympians fresh in from the Vancouver Olympic Games, including U.S. Olympic Gold Medalist Lindsey Vonn, U.S. Silver Medalist Julia Mancuso, U.S. Bronze Medalist Andrew Weibrecht, and U.S. Olympians Ted Ligety and Steve Nyman will be racing at our own Olympic Mountain. 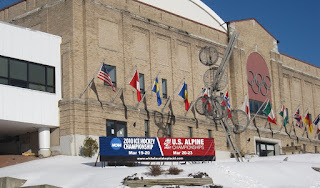 Back in the Village of Lake Placid, ice hockey will be the cold weather sport of choice when the Village hosts the 2010 NCAA Division III men's ice hockey national championships. The action commences when the first playoff puck is dropped on Friday, March 19. Not to be forgotten and one of my favorite ways to keep busy is indulging in the incredible spring skiing. We received another 10 inches of snow the night before last and the skiing has been superb. In my book, backcountry skiing luscious corn snow in 50-degree brilliant sunshine is one of the most fun and rejuvenating activities around. The Adirondacks have it all; the excitement and buzz of watching a top-level competition or participating in a private ski excursion at your own quiet ski resort in the woods. All you have to do is choose. Today's featured photo shows the Lake Placid 1932 Olympic Arena, on Main Street, courtesy of Joann Sandone Reed. Today's brilliant blue sky, visible in the photo, and warm sunshine, made today's skiing obligation a delight.